Working on a PC loosing your unsaved data due to power outage or some other glitch in the power network is real pain specially if this happen quite frequently. Even backup generator take a few minutes to start and they also will not help to prevent your system from shutting down. For this purpose, uninterrupted power is required to be delivered to PCs and other electronic peripherals. 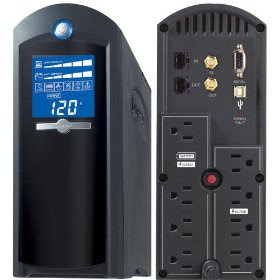 These uninterrupted backup power comes in the form of uninterpretable power supply or simply UPS. A UPS is a backup power that continues to deliver electric power even in the case of complete blackout. They are equipped with backup batteries that are automatically charged when the power in up and will continue to provide backup power is case of a power outage. This UPS has a diagnostic LCD display at its front panel which displays real time status of the backup power and output. 11 different parameters can be obtained from this LCD display including input/output voltage levels, battery capacity, estimated backup time remaining, fault condition, output frequency etc. AVR stands for automatic voltage regulation. This backup power has the ability to stabilize the voltage maintaining the voltage within acceptable operation ranges in case of certain rise or fall in the input voltages. This ensures that your connected devices are safe from electrical surges and it also prevents the backup battery from getting damaged due to those surges. The UPS comes with a PC software called PowerPanel PE Smart management Software. If there is a power outage, the PowerPanel PE automatically saves your PC files that are open and unsaved. It will then put your PC in Hibernation mode so that this reduces the power consumption and increase the backup time for your PC. This software can easily be installed on any windows based PC and it uses minimum resources and also provides visual status as shown above. Fits easily under the desk or even on a desktop. CyberPower stands firm behind their product and offer a remarkable 3 year warranty which includes complete professional technical support and a connected equipment guarantee of $500K. If you reside in the US then you can easily order this affordable backup power UPS online via Amazon without paying any shipping fee. Depending upon your location, the UPS will take 24-72 hrs to ship to your place.